Why Blogging Isn’t So Easy for Dentists. Should You Hire Someone ? You know blogging is important for your dental practice’s marketing. You’ve read all about it in this article. You’ve heard it time and time again. But it takes time, consideration, and planning. In short: it’s not easy. Add to the mix a dentist’s busy schedule, time and energy serving patients, and running a business and it’s no wonder most dental practices fail at their attempts at blogging. We’ve seen it time and time again. A practice will start a blog. They might post once. And then, what was supposed to be a lively corner of discussion and education, turns into a ghost town with nary a tumbleweed moving through as evidenced by their analytics. A blog serves two purposes. First and foremost, it’s a place where the dentist has a voice. This is where he or she will share important practice news, helpful tips and tricks, cutting-edge procedures and technology, and a slew of other things that patients want to hear about. Once this content is created the focus of the blog on a dentist website then turns to marketing. Blog posts are indexed by search engines, which means that once you publish a post Google and Bing will begin (with a week) to display it in search results if it’s well written enough to answers questions people are searching for answers to. Additionally, blog content is “snackable and shareable.” This means that people will see it, read it, and if they deem it quality enough share it on their social networks. Sharing helps to further get the word out about your practice and drive people to your dental website. Blog regularly | Create an editorial calendar with topics and post dates that remind you when a post is due. This will help you stay organized and allows you to visualize how blogging fits into your larger marketing strategy. Push posts to social platforms | Each blog post you create needs to be pushed to your social networks. Even if they get little to no engagement on the network, social posts are indexed in search engines. This creates another possible avenue for discovery. Aim to be informative | Your blog should be a place where people go to get useful information, not be sold to. There’s plenty of other places where they can see advertisements, so stick to being the helpful neighborhood dentist on your blog. Keep it short | Blog posts should be too long, as most people skim read anyway. Around 500 high-quality words is a good goal. Additionally, pay attention to formatting. Break up paragraphs so they’re easy to read, use bullet points, and offer links to other helpful bits of information. Use photos | Always use a high-quality photo that you have copyrights to in your blog posts. This helps to engage the user and can make a difference in online engagement as far as people clicking through to the post from social shares goes. Use video | Yes, video can be great blog fodder if pulled off properly. You can embed videos along with their transcript into your blog, use them to compliment text posts, or create a blog “series” that is just video. There are many ways to get creative and set your content apart. Blogging Is Hard Work, Should I Hire Someone? Writing any content is hard, whether you’re a natural writer or not. But writing marketing content that in turn has to be marketed is particularly tricky. You have several options . Of course, you could opt to do it yourself. But this option almost always leads to the earlier discussed scenario of an abandoned blog that started with great intentions and ended up going nowhere. Writing your own blog content can be as dangerous as working on your own dental website design. The easiest option and one that will be most successful is to hire someone. 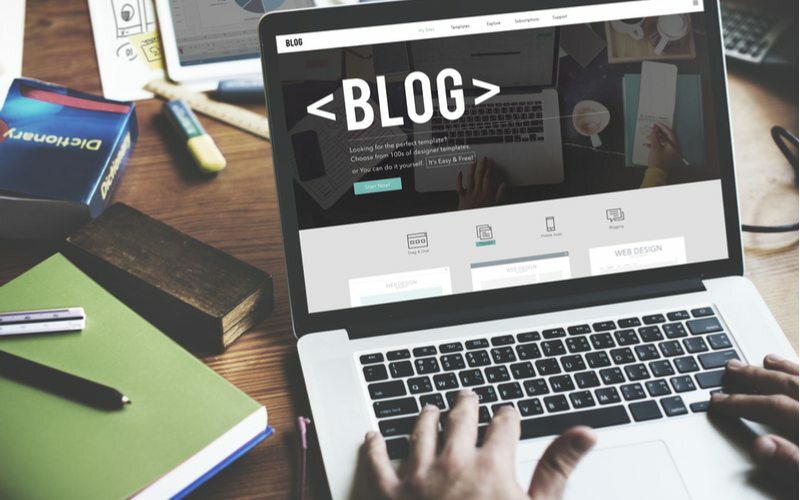 If you find the idea of brainstorming topics, performing keyword research, writing content, and finding photos daunting or simply unappealing, then hiring your blog out to an experienced dental marketing agency is the best way to ensure success. This takes all of the work out of blogging and instead creates a partnership between you and the agency. You can work with them to discuss topics and content, give feedback on posts, and have the final say, but they guide you through the complicated process of developing and marketing a blog post.